Welcome to my Summertime Foodie Friday series: Farm Fresh! This is an extra-special installment, with a World Breastfeeding Week theme. The series will run through the end of August, and I'll publish a post every week or two. So far, I've featured artichoke, kale, eggplant, beet, zucchini, kohlrabi, and this week, fennel! If there's a vegetable you'd like to see featured in the series, or if you have a preparation tip to add, please let me know in the comments. And don't forget to link up your fennel recipes in the linky below! Of all the galactagogues out there, I decided to feature fennel this week because I'd never had it before! Florence fennel is the type of fennel that has a swollen, bulbous stem which is used as a vegetable. Other kinds of fennel are used as herbs and in medicinal preparations. Along with anise, fennel is one of the main ingredients in absinthe. Fennel can be eaten both raw and cooked. Fennel is attributed with lactogenic properties primarily because of the phytoestrogenic effects it has in the body. I have to admit, I was pretty nervous about preparing fennel this week, because I don't particularly care for the flavor of licorice (which is exactly how fennel smells). For that reason, I didn't try it when it was raw, since the smell of it was quite overpowering. I chose to modify this baked fennel with Parmesan recipe to use this week because I was so apprehensive about eating fennel. I figured, if I don't like it covered in Parmesan, I won't like it prepared any way. Cut off the base of the fennel, and cut around the core to remove it. (If you don't do this, it'll just take a bit longer for the fennel to cook). You can see the core pretty easily. with the bits that were left. So, after all the worrying and hand wringing, what did I think of the fennel? I actually liked it! Jaymz liked it more than I did (I believe his words were, "very delicious") but I thought it was good enough. It kind of tasted like cooked onions, though not as strong of a flavor as I'd imagine onions would have in this preparation. The licorice flavor wasn't even noticeable. I'd like to try fennel again, though probably still cooked. What do you think? How do you like to eat fennel? My oatmeal chocolate chip lactation cookies recipe—yum! Oooh! 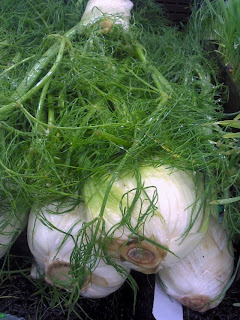 So glad you featured fennel- we love it! We usually cut it up and boil it in water with a fair amount of lemon juice in it until tender, drain and serve drizzled with good olive oil and parmesan cheese. We will have to try this recipe too though! New follower and excited you are doing this series, I'm all about trying different veggies! My husband... er, not so much.